Researchers Dr Reza Haqshenas and Professor Christian Doerig will now extend their work in studies on the Zika virus and toxoplasmosis. An international study led by researchers at Monash University’s Biomedicine Discovery Institute (BDI) has shone a light on the way the Hepatitis C Virus (HCV) hijacks the communication systems in the host cells it infects, uncovering potential new therapeutic targets for the disease. HCV affects about two per cent of the world's population. Infection can lead to chronic hepatitis, which can progress to liver cirrhosis and carcinoma. Importantly, the approach used by the scientists – which led to the identification of a drug-like molecule that stopped the virus from replicating within cells – may have broader application to other infectious diseases. This is because all intracellular pathogens rely on their host cell signalling system to replicate. The study, published in Nature Communications today, focused on protein kinases, enzymes that are key regulators of cellular processes. It built on previous ground-breaking work on malaria published in 2011 by author Monash Professor Christian Doerig, and others, who found that if host cell protein kinases were prevented from working it would kill malaria parasites. The Monash BDI researchers worked in collaboration with Canadian-based company Kinexus, and used an antibody microarray to simultaneously investigate hundreds of factors involved in cell signalling that were modulated by HCV replication, including human protein kinases. “This antibody microarray allowed us to find a number of new cell signalling pathways that were activated or suppressed by an HCV infection,” Professor Doerig said. First author Dr Reza Haqshenas said the researchers then used gene silencing technology to determine whether the genes’ cell factors identified using the antibody microarray were indeed important for HCV replication and therefore potential targets for anti-HCV compounds. They were then able to use a compound recently discovered by Harvard University investigator Professor Nathanael Gray to block the activity of one of the kinases important in HCV replication, MAP4K2. 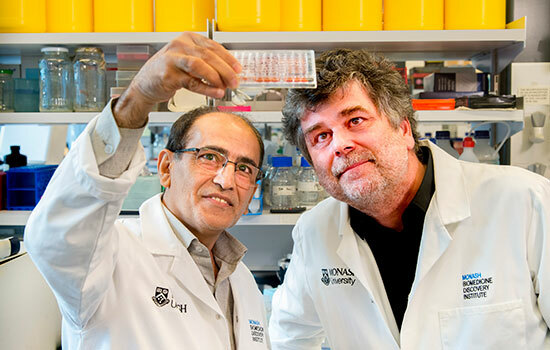 “Nathanael sent us his new molecule, and we put it in our host cells, infected them with HCV and found that while the cells were fine, they didn’t support virus replication anymore,” Dr Reza Haqshenas said. “The platform we have established can be adopted to identify new anti-infective compounds against any pathogen including, viruses, bacteria and parasites, that invade mammalian cells,” he said. “Importantly, fighting a pathogen by hitting an enzyme from the host cell is likely to slow the emergence of drug resistance, because the pathogen cannot easily escape through the selection of target mutations,” Professor Doerig said. The researchers will now extend their work in studies on the Zika virus and toxoplasmosis. The study, which included Monash BDI Professor Roger Daly, was carried out in collaboration with the Peter MacCallum Cancer Centre (Associate Professor Kaylene Simpson) and the Garvan Institute (bioinformatician Dr Jianmin Wu), Associate Professor Hans Netter, and the French National Institute of Health and Medical Research INSERM (Professor Thomas Baumert). It was supported with funding from the Australian Centre for HIV and Hepatitis Virology Research (ACH2). The paper, titled Signalome-wide assessment of host cell response to Hepatitis C virus, appeared in Nature Communications.